I had a Christmas song stuck in my head this morning. I went almost an hour singing the song over and over in my head and then wondered if the writer was from Portland…what was the song, you may ask? Rudolph the Red-Nosed Reindeer; it talks about a foggy Christmas Eve. Now, I know fog is capable of happening most anywhere, but my brain kept deducing that it had to be in Portland, since we’ve had so much fog the last week. I would also wager that we are much more likely to have fog for Christmas than we are to have snow. Rudolph would really be quite useful in multiple parts of the world–but especially the pacific northwest. Besides Christmas songs, I’ve noticed that our evening schedule sure is filling up fast each week with different holiday related events. Tomorrow we get to help celebrate Jenni’s Sparkly Birthday (I say this because golden, silver, and platinum were taken already evidently–12/12/12 is an amazing date and sparkles fit Jenni perfectly). I also have a holiday party and gift exchange/donation at work (exchange fun wrapped toys, unwrap and donate to a local charity), and before I know it my mom will be landing in PDX to spend the holidays with us! And I still haven’t started my Christmas shopping. Thanks for asking! I wish that I could just give food for Christmas, but non-edible gifts do tend to last longer. 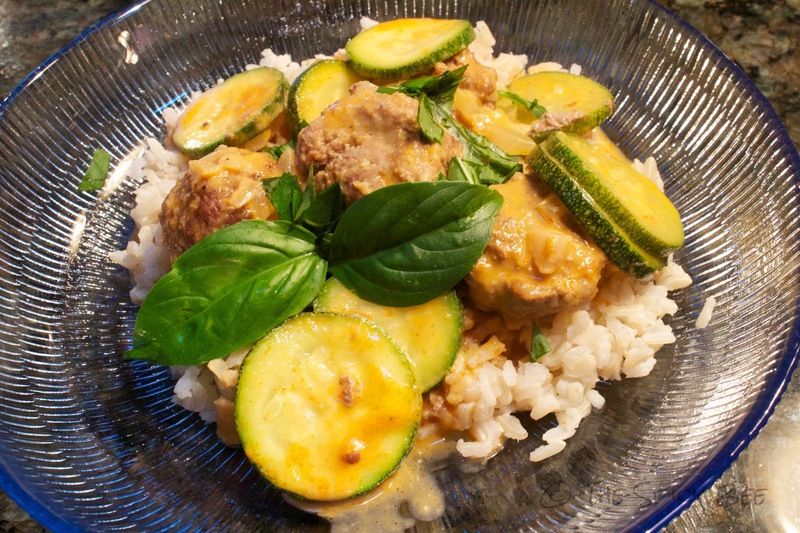 Today I’m sharing a somewhat festive meal of Red Curry Meatballs. It’s a versatile dish that can help get you through the work week. I would suggest making the meatballs on a Sunday evening and preparing the rest after work during the week. 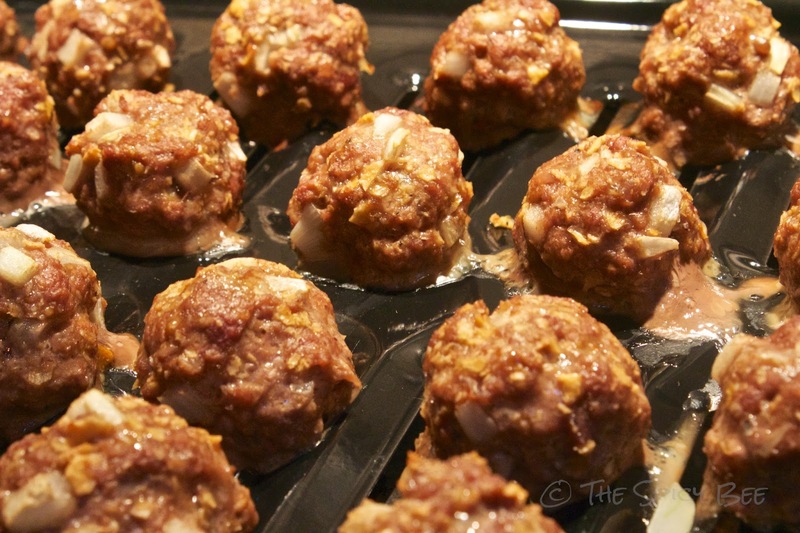 The meatball recipe is an adaptation of a Betty Crocker recipe, and can be used in a multitude of ways (I’m sure to be posting more meatball dishes as time goes on). Get the full recipe after the jump! Prepare the meatballs first. Preheat your oven to 400°F, and mix all of your ingredients. Shape 20 meatballs, approximately 1 1/2 inches in size. Place the meatballs on an ungreased broiler pan (we line the inside of the pan with foil to help make for an easier cleanup). Bake uncovered for 20-25 minutes or so until no longer pink in the center and they juice clear. If you do not have a broiler pan, you can cook the meatballs in a frying pan with coconut oil for 20 minutes over medium heat, making sure to turn continuously. Prepare your rice. Meanwhile, melt a slice of butter in an 11 inch skillet over medium heat. 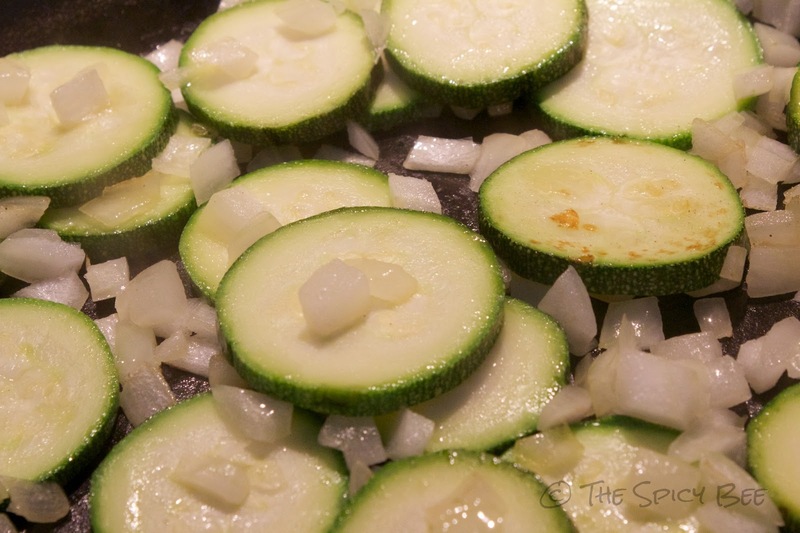 Cook your other sliced onion and zucchini until tender (about 6-8 minutes). 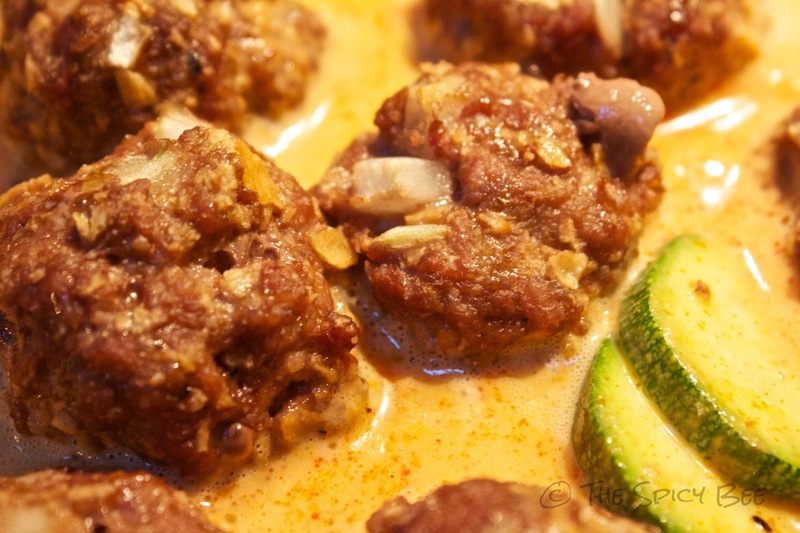 Add in your red curry paste, coconut milk, and cooked meatballs. Season up with salt and pepper to taste and simmer until the coconut oil thickens (3-5 minutes). Add one tablespoon lime juice. Serve over rice and top with fresh basil. Top with chili flakes to taste. This meal should serve 4 with possible leftovers. What is one of your favorite “festive meals” to prepare during the holiday season? Ya! Hahaha… I love that: Sparkly Birthday! Awesome. And, I live close enough that this could totally be a Xmas gift! I looooovvveee meatballs. 😉 JK, but seriously, we should get together for dinner sometime! I have only listened to Christmas music for a week and I am already sick of it! Rudolph was definitely written by someone from the NW… or maybe San Francisco. Ooh – meatballs have been one of my favorites lately (like the past 6 months!) I have to try this out! Your blog looks great! I love the changes! I love your new blog design! Haha, I am NOT ready for Christmas either. And am getting pretty tired of a lot of the same ol’ Christmas songs! I love the meatball recipe! And I love your new blog design. And I definitely haven’t started my shopping either. You just made me hungry! Those are good looking meat balls, nice recipe!